Make a simple syrup. Boil 8 cups water and stir in 3 cups white sugar. Continue to stir until the sugar incorporates with the water, for about 15 minutes. Let cool. 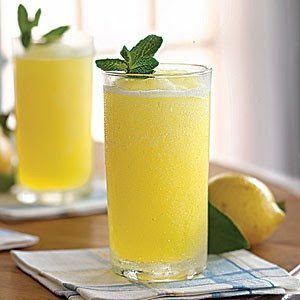 In a separate bowl, combine the juice of 2 lemons, 2 oranges, 1 48oz can of pineapple juice, 1 12oz can frozen Minute Maid grapefruit juice, 1 12oz can of frozen Minute Maid lemonade and 26oz Vodka. Once the simple syrup is cooled, add the juice/vodka mix to the syrup. Stir and transfer into an air-tight tupperware container(s) with lid(s). Freeze. When ready to serve, stir the slush, and fill the glass half-full with frozen vodka slush. Fill the rest of the glass with diet 7-Up. Enjoy!